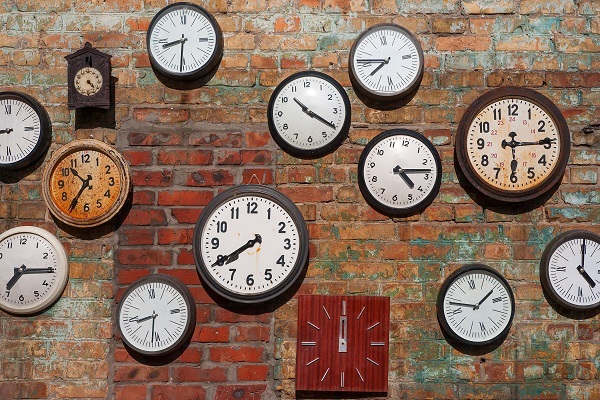 Talking about time is a very basic skill, but one that can often cause problems, especially if your main language thinks about time in a different way. Firstly, if you want to know the time, what question do you need to ask? Well, if you are sure that the person you are asking knows the answer, you can simply say: What time is it? or What’s the time? (this is less common in US English). However, if you are not sure if they know, for example if you want to ask a stranger on a train or in the street, you can say: Excuse me, do you have the time, please? or (in UK English) Have you got the time, please? There are of course, various methods of telling the time: the 24-hour clock, the 12-hour clock and the old-fashioned way, using a round clock with hands. In general, we only tend to use the 24-hour clock system for timetables (UK) / schedules (US). For instance, we can say that a train leaves at 20:15 twenty fifteen. In the US, use of the 24-hour clock even for timetables is not common. In more general speech, many of us move between a 12-hour clock and the more old-fashioned system we use for clocks with hands. With both systems, we say o’clock for whole hours: 3:00 three o’clock. With the 12-hour clock, we may say the numbers for other times: 3:23 three twenty-three / 7:45 seven forty-five. However, it is also common to convert 12-hour times into their old-fashioned equivalents, especially for units of 15 or 30 minutes, for example saying half past five for 5:30 (half past is much less common in US English). Be aware that – unlike some other languages such as German – we relate half hours to the hour before, not the next hour. There are some other differences between UK and US English. For instance, for 4:15, both say four fifteen; both could also say (a) quarter past four but this is less common for Americans, and Americans more frequently say (a) quarter after four. Just to make things more complicated, for 8:45, both can say eight forty-five or (a) quarter to nine; Americans can also say (a) quarter of nine, but this is less common. For times between one and twenty-nine minutes after the hour, UK English uses past and US English after (although past is also sometimes used in US English). So 5:20 is five twenty (UK and US), twenty past five (mostly UK) or twenty after five (US). And for times between thirty-one and fifty-nine minutes after the hour, UK and US English use to and US English sometimes uses of. So 7:40 is seven forty or twenty to eight (UK and US), or twenty of eight (US). In formal contexts, we use a.m. and p.m. to specify whether a time is before or after midday (mostly UK) / noon (mostly US): 4:00 four a.m. (note that you shouldn’t say ‘o’clock’ with these abbreviations). In more informal speech, we say, e.g., four o’clock in the morning/afternoon, seven o’clock in the evening or eleven thirty at night. And while we’re on the subject of time, did you know that ‘time’ is the most commonly used noun in English? Next month I’ll be looking at some common phrases containing this word. This type practice, I follow since my beginning. This week’s post helps me to refresh once again.Thank you dears. It is intriguing and compelling article and it is also very worthwhile to have this beneficial information about the time not merely in the UK but also around the would such as the united state and Germany. GOOD notice! Very sharp mind you have. 8:45 is quarter to nine, no??? Thanks for the lesson. I have a question. Can we both forms in the countries informed and the people understand me the question? I’m sorry, Alberto, but I don’t understand your question.
. Do you know what time is it?
. Do you know what time it is? I think it might be worth to note, that in Britain saying “half five” for 5:30 is very common, with the word “past” in “half past five” being omitted. This can be quite confusing, especially for speakers of Slavic languages. Maybe I misunderstand, but in English you relate to next hour; half [past] four is 4:30 whereas in German halbvier (half four) means 3:30, and not the other way around as suggested in the article. Sorry, Claes, but you said it yourself! In English, when you mean 4:30 you actually read it as “half past FOUR”, so you’re making a reference to the PREVIOUS hour, unlike German, which makes reference to the NEXT hour, i.e. halb FÜNF (five). How I can improve my writing and speaking in English? Please give me information about this. I faced a lot of problems in writing and speaking in English. Yes, people do say ‘half eight’ – in British English anyway – I’m not sure about US English. But it means half past eight, not half past seven. Helping indeed! More power to your elbow. I follow all of your posts. It’s really helpful. Thank you. Hi Stefano, we’re sorry, a technical hitch meant our ‘New Words’ weren’t published yesterday. They have just been published now. Thank you for noticing! Thank you for your reply, just published on the Glossarissimo! blog! Thank you for the useful post, but in a part I am confused. If 7:40 is said “twenty to eight”, it sounds same as twenty-two eight (22:08). If it is correct, how can I tell “twenty to eight” from “twenty-two eight”? For 22.08 we’d be more likely to say ‘twenty two oh eight’. Thanks. Give me more about time. Hullo, Is it possible to use or hear this question about “time.” What time do you make? _ and to answer I make it half seven, etc. You have to say ‘What time do you make *it*?’ You’d usually say that when you are checking whether your watch/phone etc is saying the correct time. I think Brits would be more likely to say ‘eight forty eight’ for such a specific time. We tend only to say ‘five to three’, ‘quarter past twelve’ etc for multiples of 5. I really appreciate your teachings. I think they are very useful and important for teachers, professors and students. As a matter of fact, thanks for answering my last question. The first one is correct. For the second one, you have to say ‘What time is *it*?’ They are the same in meaning and equally correct.